Ben Risney, a member of Masters of the Chainsaw, carves an Indian face out of a piece of wood in front of a crowd at the Seneca County Fair. Risney was at the fair last week, making four carvings a day each day he worked. TIFFIN — Ben Risney has a firmer handshake than most men. If he wanted to, he could probably drive a nail with his fist. Good thing he’s also one of the friendliest people anyone could ever meet. Risney also has a more interesting job than most. He carves objects with a chain saw in front of large crowds. Surrounded by netting to protect the audience, Risney uses different sizes of saws to mechanically whittle a large chunk of wood into a natural sculpture. Risney has been doing chain saw art for about 15 years. He is part of a group called “Masters of the Chainsaw,” and is one of the top chain saw artists in the world. He does about 12-15 shows a year. This past week, Risney displayed his talent at the Seneca County Fair. He performed four shows a day. During each show, Risney would carve a new object—a wolf, a bull, a bear, a fish, and so on. Each carving took him about 45 minutes to an hour to complete, as well as an hour to set up beforehand. 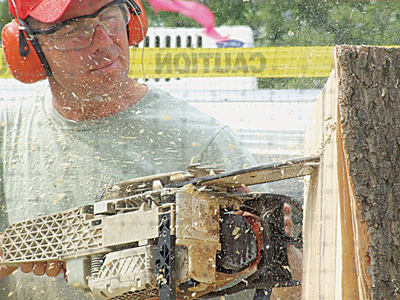 Masters of the Chainsaw, which has several artists across the United States, started in 1992. The organization currently has 13 exclusive members and 36 part-time members. Along with the U.S. group, there is also a Masters of the Chainsaw in Japan, founded in 2001. Masters of the Chainsaw asked Risney to be one of their artists. “They approach you,” he says. Risney had entered contests held at state fairs and logging competitions before joining the organization. His work gave him enough of a reputation that he could be called one of the Masters. When he isn’t on the road, Risney spends time back home in Pennsylvania on his ranch, where he breeds horses. Growing up in the Adirondacks mountain region, Risney comes from four generations of loggers on both sides of the family. “I grew up around wood and power equipment: stuff like that,” he said. His family worked in logging and carpentry — wood is in his blood. Some of the projects Risney has carved include a 35-foot-tall totem pole, a life-sized stallion and a 15-foot-long horse jump that looks like a running fox. Aside from travelling across the United States, Risney has done shows in Australia, England and Japan. He still competes in contests, putting his skill to the test. Some of these competitions sound pretty intense. Risney says that he’s never quite sure what he’ll end up with when he starts carving. “I kind of just use my imagination and go from there,” he says. But regardless of what he has carved, all of his work looks great. Risney’s work will be auctioned off today, Sunday, July 30 at 3 p.m. at the Seneca County Fairgrounds.